The blessings of homeschooling Hayden continue to be revealed to me daily in the little things that I never could have even conceived as being a blessing. A huge blessing is the quality time he and I get to enjoy with one another, of course. Quality time was something I was definitely not getting enough of when he was enrolled in public school, so that seemed like a “gimme” when we made the switch to a homeschool environment. But an extra perk of having quality time, is when there are shared interests between a parent and a child. For Hayden and me, that became a love for Texas Country music. I have loved music for as long as I can remember. My mom used to let me go to sleep with the radio on and I would always get in trouble for singing, rather than sleeping. (Not that I can even sing! ha!) I love language and stories and the way music can tell a story and transport you to a different time and place is a beautiful gift from the Lord, in my opinion. He created music for us to enjoy and I certainly do. On days when I took care of Hayden alone without a nurse, he and I would use that special time to listen to all kinds of music. And being a teacher, I know that you can turn anything into a lesson and that is what music became for us. The lyrics of any song became a history lesson, or a literature lesson as we talked about rhyming and poems, deeper meaning of words and what we thought the song writer was feeling in that moment and why he wrote those lyrics just so, and how that same message could apply to our lives. This really became a special thing just for Hayden and Mom. During Hayden’s shower each morning, he would have me “turn up his jam” and we would just sing and rock out to music on shuffle on the Amazon app. I often would guide Hayden through dissecting the music for deeper meaning and making connections to his own life through the music. I treasured this time with Hayden. We had a few favorite artists we would stream; lots of Texas Country and Southern Gospel, but very quickly Hayden’s all time favorite became Aaron Watson. Back in August, Ryan and I went down to Gruene Hall with my brother and his wife for a couples’ weekend. Ryan and I met Aaron after his show and snapped a quick picture together. Hayden was just memorized by this photo and all the video I took of the show [per Hayden’s adamant request ;)]. He decided he needed a chance to meet Aaron, too, since Mom and Dad already had. And since Hayden is who he is, he just knows what he wants and he goes after it with confidence and vigor. This goes along with the lesson we have always told Hayden and all our boys; if you want something, go do it and don’t give up. That is exactly what Hayden did. He did some research and checked Aaron’s tour schedule on his website. He realized Aaron was going to be doing a show in Denton which was about 30 minutes from our house. Hayden decided this would be the perfect place to attempt a meeting. Not completely knowing how you just reach out to a stranger to set up a meeting, we decided we would pray about it. I must confess that historically, praying about something is not what I have always done first. This is deeply routed back to our NICU days and is a longer post for another day. But this particular day, in this moment, it was on my heart to teach Hayden that when something seems impossible, our go to has to be prayer. And so we prayed about it asking God that if it were possible, we would love to meet Aaron Watson and if it was not going to work out at this time, that we would be ok and not too upset. I am Hayden Hensley and I am 9 years old. I am Aaron’s biggest fan and we prayed And hoped that tomorrow we could meet Aaron Watson during sound check we live near Denton I read online about tomorrow’s night show and we even called rocking rodeo I looked up the phone number I had my mom called. Can I meet Aaron tomorrow I will understand if I can’t I will keep trying. “If you’re not in love” inspired me to always remind mom to flush also put down the toilet seat. I was so impressed with Hayden’s letter! I loved how he took those last two songs and explained how he related to them. It’s exactly what we had been doing over the weeks prior to this talking about meaning of lyrics. Clint was so precious and relayed the message to Aaron. We were floored when Aaron invited us to come to the venue the next day! I’m not sure Hayden had ever been more excited about anything!! The entire drive there he was seriously losing.his.mind!!! It was probably a good thing this meeting happened as a whirl wind because I’m not sure I could have tolerated this much excitement for too much longer! When we arrived at the venue, I texted Clint and told him we were outside. Clint met Hayden at the front door and gave him a GIGANTIC hug as if they were best friends for ages. Of course, if you’ve ever been blessed to receive a hug from Hayden, I’m not sure he knows another way to hug. Clint ushered us in and the band was finishing up their sound check. Aaron was out on his bus and Clint went to go get him while Hayden just looked around and soaked it all in. It was his first time in a honky tonk 😉 A quick few minutes later, Aaron came out and again, Hayden just drenched him in a HUGE, excited hug! It was so precious to see Hayden share love so freely and willingly. There are so many details to this story that are just precious to my heart. I could take the rest of your day going through each one, but my favorite one of all is how Aaron had never met Hayden before and had absolutely no forewarning about Hayden’s medical issues, but he took one look at this child and saw him for who he was. Never once during that hour of visiting with Hayden – yes, an HOUR of his time was spent sitting on the ground talking to Hayden and answering all of his endless questions, and even playing him a tune or two – never once, did Aaron skip a beat. As we wrapped up our visit, Aaron invited Hayden and our family to come out to his house over the Christmas holidays for game night with his family. Hayden was so excited and we were all looking forward to this upcoming night of fun. The next few weeks went by with Hayden texted Aaron on occasion and our excitement building for Hayden to attend his first ever Aaron Watson concert in December at Choctaw Casino in Durant, OK. That may not seem like a big deal, but for Hayden, who for years had been ridden with sensory processing issues and could not tolerate dimmed lights, loud noises, or clapping, for him to be looking so forward to a “sensory overload” was promising to us. The day of the show came and Hayden stayed in the auditorium and enjoyed the show for an entire hour! He eventually asked to leave early just because he was starting to get tired. He loved the show and afterward he got to catch up with the band and Aaron briefly before hopping on the elevator to go to our hotel room. Hayden’s two favorite things – Aaron Watson and a hotel! He was in heaven! Over the Christmas holidays, we did in fact make it to the Watson house to play games, eat pizza and cookies, and just hang out. We all had a great time. Our boys had so much fun with the Watson kiddos who are very well behaved, so adorable and some may say sassy 😉 Hayden has a “crush on Jolee Kate’s sassiness.” (I think he can relate to the sass!) And Aaron’s wife is such a sweet, godly woman. I left there that night feeling refreshed and very “normal.” I realize that’s ironic… I mean, my family had just spent an evening with Aaron Watson and his family in their home which is a completely random, bizarre thing that I had never envisioned happening just a few months prior. But the thing of it is, they had invited us over and welcomed us into their home and treated us like normal people. So often, we get overlooked by our peers. We don’t get invited to family game nights. We don’t go to dinner with other families. I don’t think it’s because we’re unloved, I think it’s just that often times, people don’t know what to do with our situation. It’s overwhelming and it’s a lot to deal with and so many times Ryan and I feel complete isolation when we see other families around us doing family activities and we miss the boat. But here was a family who welcomed us in, treated us just like friends and were not intimidated or overwhelmed by us. Just like Aaron and Hayden’s first meeting, the Watson family just took us at face value, loved on us and poured into us more than they really will ever know. And that was such a gift to our family. Aaron has a new album coming out February 24 of this year called, “Vaquero” and the backdrop of the photo taken for the album cover is a beautiful piece of artwork that was painted in Coleman, Texas by a spunky girl named Cal Johnson. Ryan’s parents still live in Coleman and so each time we visit Coleman, Hayden likes to go to the “Vaquero Wall” and take a picture, just like Aaron did. This particular photo below is one Aaron shared on his Instagram page. Not very long after this photo was shared with the world, Hayden was invited by Cal, to be a part of a news story from a local station in Abilene, TX. Hayden was more than happy to be a part of the newstory as he sees himself as #HPtheVIP anyway 🙂 but it was such a special treat for Hayden and us – we are so proud of how brave and confident Hayden is. Kathleen Barkley, from KTAB in Abilene did such a great job on this story! The link for the newstory is here: KTAB. Hayden has done such awesome things in his few short years on this earth with many more mountains to move I’m sure! Our family’s friendship with Aaron Watson and his family has been such a fun, surprising blessing. I don’t know a lot of “famous people” – I mean, besides #HPtheVIP, but it seems to me that Aaron is the most sincere, genuine person who really loves his family, fans and friends. We’re lucky to have met him and forged a friendship with him! While all of that is so very exciting, the takeaway for me that I have been treasuring is the way God has used this entire experience to just love on me and my family. I love the joy that Aaron brings to Hayden, I love the people we have met and shared with since Hayden’s story aired on KTAB, I love the person Hayden has become. I can’t help but think that if it hadn’t have been for me homeschooling Hayden, this love of music we share wouldn’t have happened. And if I hadn’t have taken a leap of faith and answered His call to pursue a teaching certification three years ago out of the blue when it made NO sense, I probably wouldn’t have been ready and comfortable homeschooling Hayden. It’s like an offshoot of trusting God in all things and taking leaps of faith along the way of life resulted in a strand of blessings for us, but hopefully also for others, that I could never have imagined. I can’t help but ponder how many people see Hayden and our family and are even the slightest bit changed, or perhaps intrigued, by what it is driving this thing. It’s Jesus, y’all. It just is. If there is something you feel He’s calling you to trust Him on, trust Him. Do it. He loves you. Let Him love on you. It’s not an easy road to walk, but we’ve got to do the thing He called for us to do. I often think, if Hayden had been healed before birth and never had an ailment in the world, I would never have known you. I wouldn’t be here blogging to you and I definitely wouldn’t be the person I am today. I wouldn’t share our story so openly and boldly. And even though this path is a rough one, He’s done so much more with me on this rocky path than He would’ve gotten out of me if I had been on the smooth sailing, care free path. So for the that, I believe with all my heart His plans are good. Our family loves you and we thank you for letting us share our journey with you. And for goodness’ sake, if you go to Coleman and take your picture just like Hayden (and Aaron ;)), please take Hayden’s advice: Hat down, Guitar UP! Pre-order “Vaquero” here and get five songs instantly. Follow Aaron Watson on Instagram at aaronwatsonmusic or follow him on Facebook at www.facebook.com/aaronwatsonmusic. Hayden’s most recent hospitalization was a trying time on all members of our family. For Hayden, of course, as he wasn’t feeling well and was fighting a bacterial pneumonia. As mom and dad it was difficult on us, watching Hayden in pain and also managing the rest of life’s duties. But for Hayden’s younger brothers, especially, this was a difficult time. Hayden hasn’t had this lengthy of a hospital stay in quite some time. The last inpatient stay he has had was nearly three years ago. The first three years of Hayden’s life were mostly spent in the hospital. So Ryan and I are pros at this way of life. We were just enjoying the break of hospitalizations over the last few years. Even now as Hayden is home with us and healing well, we know it’s not an “if” he goes back into the hospital; just a “when” he goes back in. The extra challenge now, though, compared to those first three years of Hayden’s life, is that we have a couple of extra passengers along for this ride. Hayden’s younger brothers, Grayson (4) and Ethan (2), are now old enough to understand the implications of Hayden’s illness. This most recent hospital stay was a challenge for Grayson to cope with. Grayson was concerned for Hayden’s health and he was asking his teacher and babysitter and any adult that would listen, “How was Hayden’s xray today? Is his lung any better now?” In addition to being strong willed, Grayson has a kind, sweet soul and loves Hayden more than he even realizes. 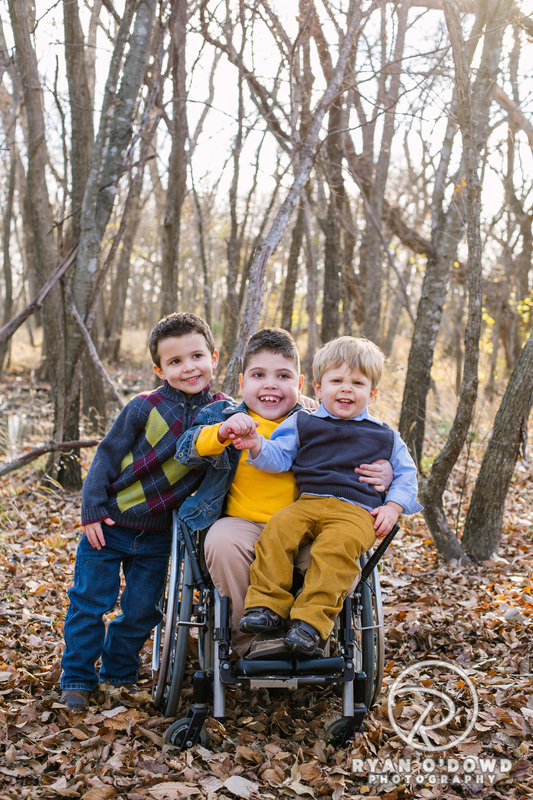 Grayson has been around hospitals, doctors, therapists, and clinics his entire life. In fact, our first announcement to the world that Grayson was on his way to join our family, was made in Hayden’s hospital room. Hayden was inpatient again at Texas Children’s Hospital with an illness. During that stay, Ryan and I announced to the grandparents that I was pregnant – and the next sentence that followed was, “Could one of you accompany Hayden down to xray tomorrow since we can’t expose the baby to radiation? !” It’s one of those memories we treasure and enjoy laughing about. Such is life! I often see the various ways people look at our family when we are in public together. I’ve seen it all – shock, awe, pity, concern, curiosity… I would say of my community of special needs families, we are an anomaly. Hayden alone is an anomaly! But to have your oldest child have special needs as intense as Hayden’s and then have two more children, makes for an interesting set of circumstances. The truth is, though, I haven’t always been open to growing our family after Hayden’s birth. I firmly believe in PTSD after a NICU stay of any amount of time. A stay of seven months in NICU only generated a laundry list of worries for me. I was so afraid of all of the conditions I saw and learned about during Hayden’s NICU stay, that I was too scared to have another child after Hayden. It wasn’t spina bifida I was scared of. That I could do. I knew all about it. I was the expert. It was all of the other conditions I never knew existed until I was enlightened in 2007. My mind was made up. Hayden would be it. He was plenty of work as it was. Why risk it with another child? Ryan was convinced I would come around eventually. My strong willed mind was convinced I would not. Thankfully, though, I yielded my selfish strong will to God’s will. I remember clearly the day He spoke to my heart. The words that came over me were, “This is for My glory. Even if….. It is still for My glory.” It was like my eyes were opened and I came out of being in the dark. Of course. If I claim to trust in the Lord, then let me trust in the Lord. If I had another NICU baby, another chronically ill child, a child with any array of rare conditions, or a completely healthy child – I had to let that be for His glory. As I mentioned, Grayson joined our family and jumped right in to the chaos in 2010. I used to drag that baby boy all over kingdom come with us. I would nurse him during Hayden’s occupational therapy sessions, I would change him on the patient tables at the doctor’s office during appointments. He grew up playing on physical therapy equipment and learned to walk by ten months, certainly from all of the skills he picked up during our “two for one special” each week at therapy. I know the Lord must have some amazing plans for that boy because the strong willed spirit that he arrived on this planet with, must be intended for something phenomenal. His love and compassion for Hayden became even more evident over these last few weeks. I am so happy I chose to trust God and let Him lead our family in the direction He had planned for us. And man, I’m glad I got on board with that lesson! Because in 2013, God had a little surprise plan in mind that He never warned us about. Our third little boy, Ethan, joined our family in 2013 as precious as he could be. What a wonderful surprise he was! Ethan gave Hayden the honor of being a big brother twice and he also gave Grayson someone to boss around with that strong will of his. My three boys are my everything. All parents have their list of parenting worries, I’m sure. I do, too. My list just looks different than a “typical” list. My worries are that I’m not giving enough attention to my little boys…that they’ll resent or be jealous of Hayden and the time we invest in him and his care…that my littles will feel they play second fiddle to Hayden…that Hayden will be jealous of the ease and abilities my littles have in life…that I can’t be enough for everyone all the time. And I can’t. I’m not supposed to be. The most important job I have as their mother is to lead them to the One who will always be enough for them. Who will love each of them completely. The God who will heal their heart when they feel neglected or jealous or sad. I realize that the God who loves me completely and heals my heart when I’m sad, loves them just the same. When I put my trust in Him and allowed Him to be in control for His glory, it meant I no longer had to worry about my boys. I only had to pray for them and guide them and teach them to seek God’s will and His glory, above all else. I pray that my three boys’ cord always remain tightly braided and that, not in spite of our family dynamic, but because of it, they stay bound together for all of their time here on earth, loving one another and caring for each other. And doing it all for His glory.